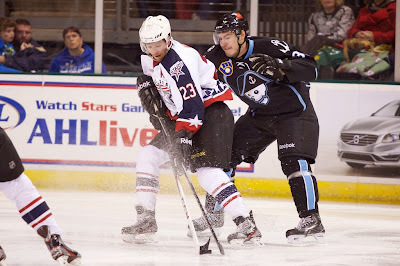 After getting into three games with the Dallas Stars, Travis Morin has been assigned to the Texas Stars this morning. At the same time, Aaron Rome was recalled from Texas. Rome was assigned to Texas for less than 24 hours and did not play in last night's game in Toronto. Morin will stay in Canada, joining Texas for tomorrow's game in Hamilton, Ontario. Morin has been tied in the points race in the AHL by Syracuse's Nikita Kucherov during his absence. The Dallas Stars announced today that the club has reassigned forward Travis Morin to the Texas Stars, Dallas' development affiliate in the American Hockey League (AHL). The team also announced that it has recalled defenseman Aaron Rome from Texas. Morin, 29, was recalled from Texas on Nov. 12 and appeared in Dallas' last three contests, where he registered two shots and a plus-1 rating. Prior to being recalled, the Brooklyn Park, Minn., native led the AHL with 24 points (10-14=24) in 13 games this season. Morin was also selected as the CCM/AHL Player of the Month for October, registering 19 points in eight games (8-11=19). The 6-foot-1 190-pound forward was drafted by Washington in the ninth-round (263rd overall) of the 2004 NHL Draft. He was signed by Dallas as a free agent on July 12, 2010. Rome, 30, has skated in eight games for Texas this season, registering one assist and a plus-1 rating. The 6-foot-1, 220-pound defenseman was Los Angeles' fourth-round selection (104th overall) in the 2002 NHL Draft and was signed by Dallas as a free agent on July 1, 2012. Did Rome even leave Dallas? How do you send someone "down" for 24 hours when both teams are on the road? The Rome assignment might have just been a paper transaction; your'e right.